The Stripe payment gateway for WooCommerce lets you accept payments directly onsite, and includes the option to accept Payment Requests (Apple Pay and Google Pay), SEPA, and more international payment methods. Download it now at WordPress.org. See Changelog. Go to Plugins > Add New on your WordPress site. Enter WooCommerce Stripe in the Search Plugins bar. The author is Automattic/WooCommerce. To learn more, see Installing and Managing Plugins. Go to: WooCommerce > Settings > Payments > Stripe. Tick the Enable Stripe checkbox. Untick to disable. Enter a Title (required) and Description (optional) seen by the customer during checkout. Tick the Enable Test Mode checkbox, if you wish to test before going live. Untick to begin accepting payments with Stripe. Enter your Live Secret Key and Live Publishable Key (obtained from your Stripe account). The Test Secret Key and Test Publishable Key are different and should only be used when Enable Test Mode selected in step 4. Enter Statement Descriptor, a description that appears on a customer’s bank or credit card statement. This cannot be blank and may be up to 22 characters. The statement description must contain at least one letter, may not include these characters > < " '. In addition, only alpha-numeric characters may be used. Tick the checkbox to Capture Charge Immediately (Authorize and Capture at the same time) or untick to only Authorize. If you untick the box, you’ll need to capture funds manually for each order within 7 days otherwise the authorization will be canceled alongside the order. See our FAQ for more. Enable 3D Secure (optional) means to force customers to go through 3D Secure payment process if the payment method supports it. 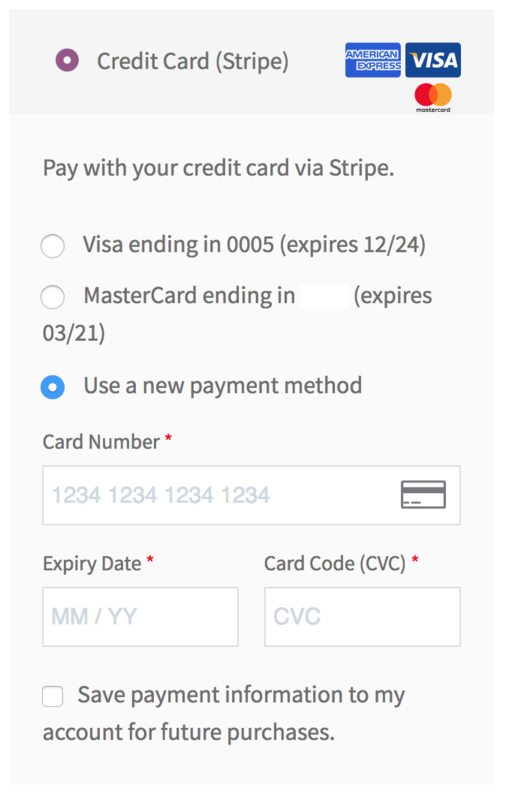 Enable Stripe Checkout if you prefer a popup to request details and using a checkout image. Please see next section Stripe Checkout to understand how it appears for customers and how this works. Enable Payment Request Buttons (optional) if you wish to give customers the ability to pay via Apple Pay or Google Pay. 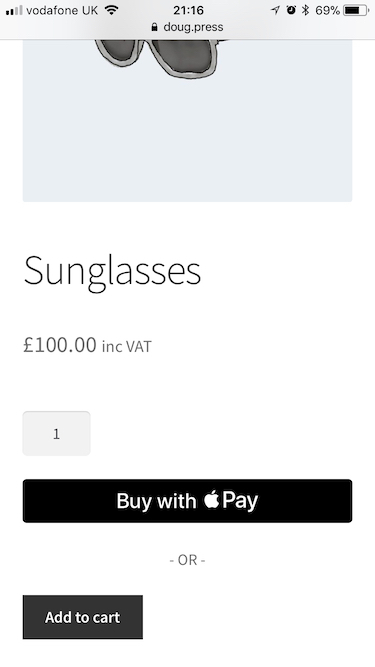 For example, this will prompt Apple Pay if using Safari or Chrome Pay if they’re using Chrome browser. The customer will need to be using a supported browser as well as having credit cards saved to their account. Payment Request Button Type will change the type of button to show. Payment Request Button Theme will change the appearance of the button to show. Payment Request Button Height will change the height of the button to match your styling preferences. Saved Cards, if you want to give Stripe customers the ability to use a card saved on their account for future purchases. Log Debug Messages, if you wish to save logs that can help you/us troubleshoot your site. Can be disabled and enabled as needed. Webhooks are a way for Stripe to communicate with your site. It provides information such as the status of the transactions to your WooCommerce site and can even update the order based on that information. We highly recommend for you to set this up on your Stripe dashboard and it is as simple as copying and pasting a simple link. If you go to your WooCommerce Stripe settings page under Stripe Gateway, you will see a generated webhook link. 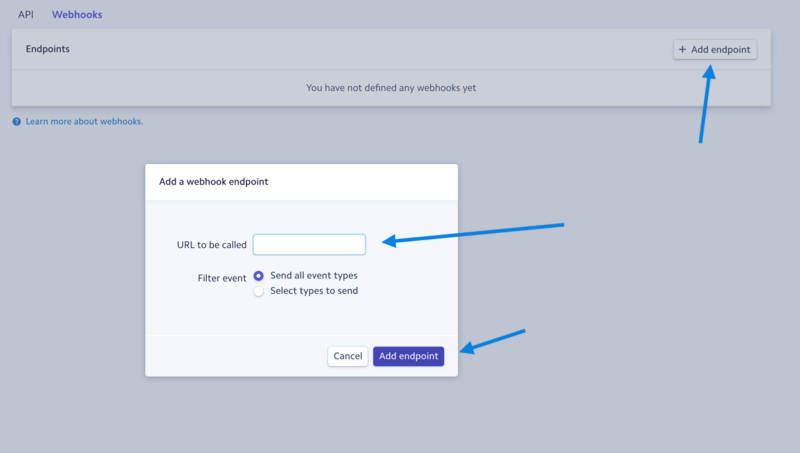 Then go to your Stripe Dashboard Webhook Setting and click on “Add Endpoint”. Paste the link into the URL field and click on “Add Endpoint”. You want to choose “Send all event types”. The same single user account credentials cannot be used to make purchases in both Live Mode and Test Mode. Stripe Modal Checkout is being removed in the 4.2.0 release of the Stripe payment gateway extension. Click here to learn more about the changes. Stripe Checkout Image: Enter the URL of a 128×128 px image/logo to be displayed at checkout. Use an image already uploaded to your site or upload one now at Media > Add New. 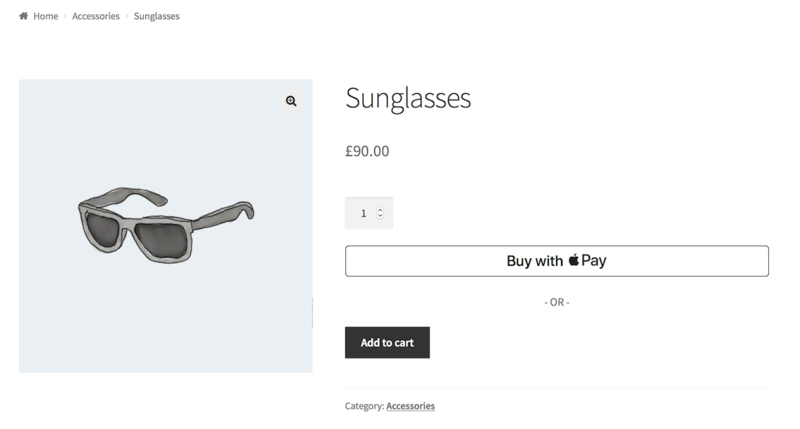 Stripe Checkout Description: Shows a description of your store on Stripe Modal Checkout. 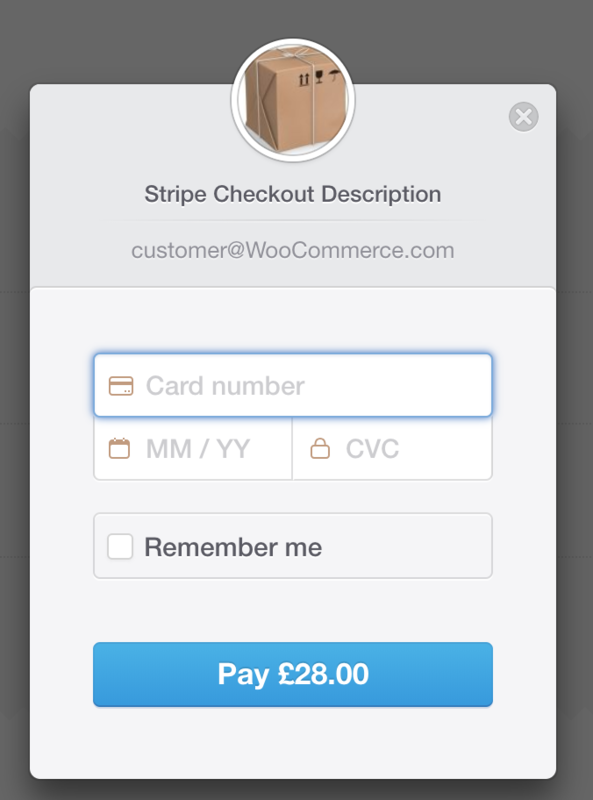 Enabling Stripe Checkout provides a popup instead of the standard payment form (the default setting). A pop-up is used to collect credit card details from the user. Since version 4.1, the Stripe Checkout (modal popup) flow has changed. It now requires one additional step before the modal popup is shown. This is so that checkout form validation can be done prior to Stripe Checkout engaging. If enabled, this option shows a “Continue to Payment” button and modal credit card form on a new Pay for Order order-pay page, instead of credit card fields directly on the page. We recommend you leave this disabled and use the embedded form as that is the preferred method. Please note that customers who choose a saved payment method won’t see this page. For more information about Stripe Checkout, please Stripe’s own information page. 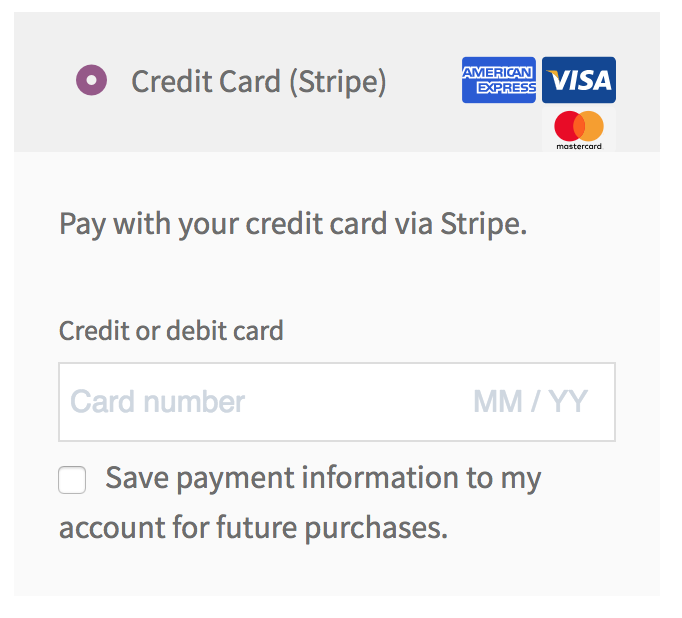 In version 4.0.0 of the Stripe payment gateway extension for WooCommerce, all Payment Request buttons are activated (on your site) at once. Apple Pay and Google Pay are the most well known, Google Pay is the name for all payment methods which fall under the Google umbrella, including Android Pay, Chrome payments, and Pay with Google. Most official documentation may still refer to “Google Pay” or “Android Pay” but for customers on your site, these are all the same. To see what a payment request button will look like and how it will behave, go to the Stripe.com Payment Request button documentation page. Before you start using Apple Pay, you must accept the Terms of Service in your Stripe dashboard at this link https://dashboard.stripe.com/account/apple_pay– Stripe.com Dashboard > Settings > Apple Pay. 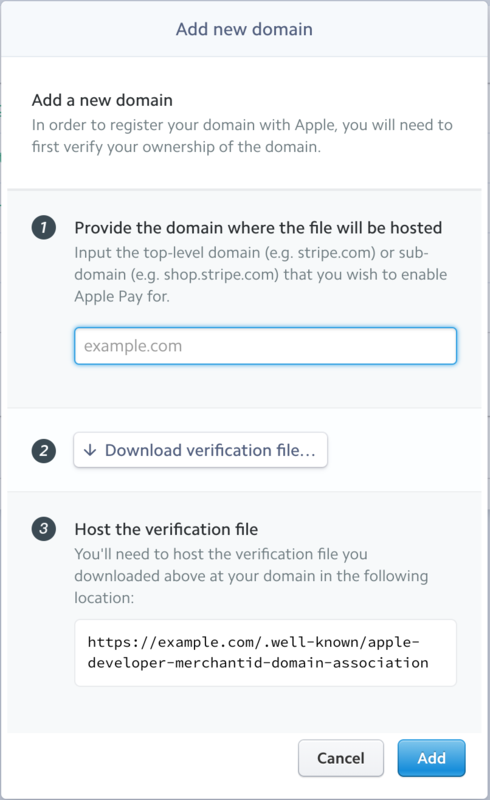 After this, you will then need to add the domain of your site exactly as it loads, include the www, or leave it out, but remove https://as Stripe.com will find this. Note: For the WooCommerce Stripe extension, you do not need to upload the verification file to your site – the extension does this for you in the background. After you’ve added the domain, you can check that the file exists by navigating to example.com/.well-known/apple-developer-merchantid-domain-association – replacing example.com with the domain you entered. The domain will then show on your Apple Pay Stripe page under “On the Web domains”. Customers will need to have a payment method from a supported bank or payment card provider, please see the Apple Pay support page for more details, along with a compatible Apple device. Make sure that the Payment Request Buttons option is enabled, there is no other setup for you to accept payments via this method. Note: the Google Pay button on mobile devices will only show when there is a saved payment card and with all the permissions (Location optional) allowed for Google Play services. Customers need to have a payment method from a supported bank or payment card provider. More details at Google Pay Help. WeChat Pay – coming soon! For detailed information about these payment methods, please visit Stripe Payment Methods, alternatively Stripe.com has a Payments overview page with a lot of useful information. 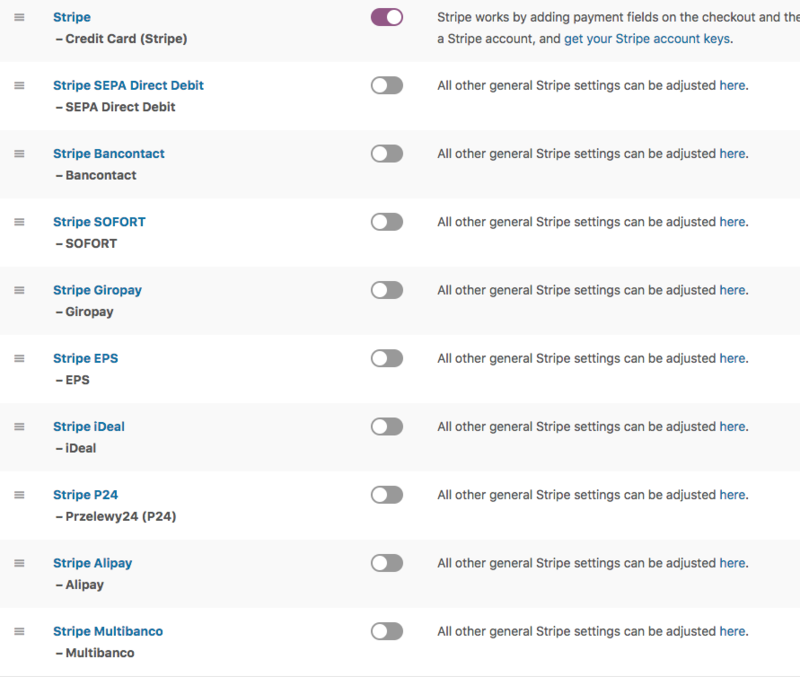 Most of these additional payment methods need to be enabled under Payment Settings on your Stripe.com Dashboard. Some may require additional information to work. 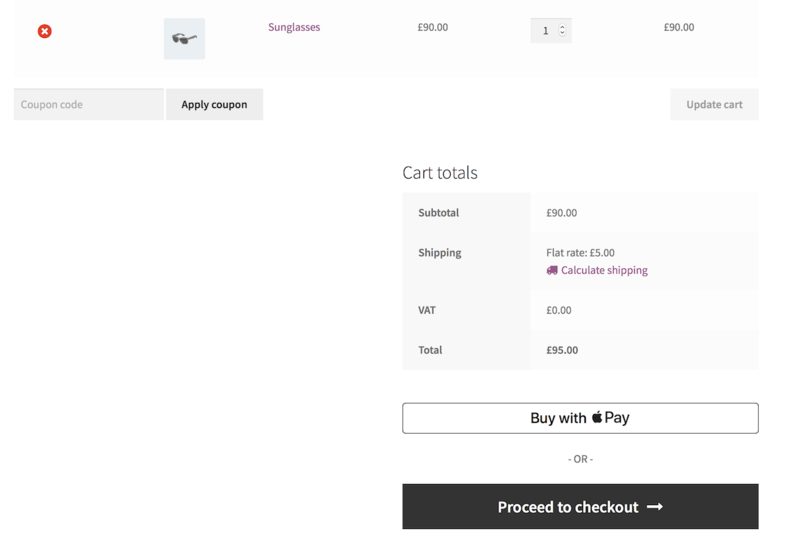 Once enabled in Stripe, they can then be enabled under WooCommerce > Settings > Payments (note: ‘Payments’ was formerly called ‘Checkout’ prior to WooCommerce 3.4) by clicking the slider icon or by clicking on the payment service name and enabling there. You can also change the title and description of each service. 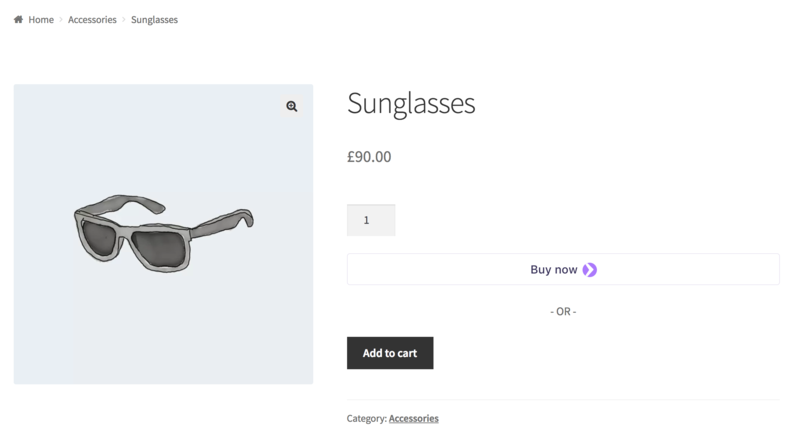 Customers pay on the checkout page, with version 4 of the extension, the form now uses Stripe Elements which provided enhanced security, styles, and a better customer experience above the standard WooCommerce fields. This section describes all hooks available to you if you need to manipulate how Stripe functions. This is more advanced. If you’re unfamiliar with how hooks work within WordPress, go to: Hooks. wc_gateway_stripe_process_response ($stripe_response, $order) – The response we get back after calling a charge request to Stripe. 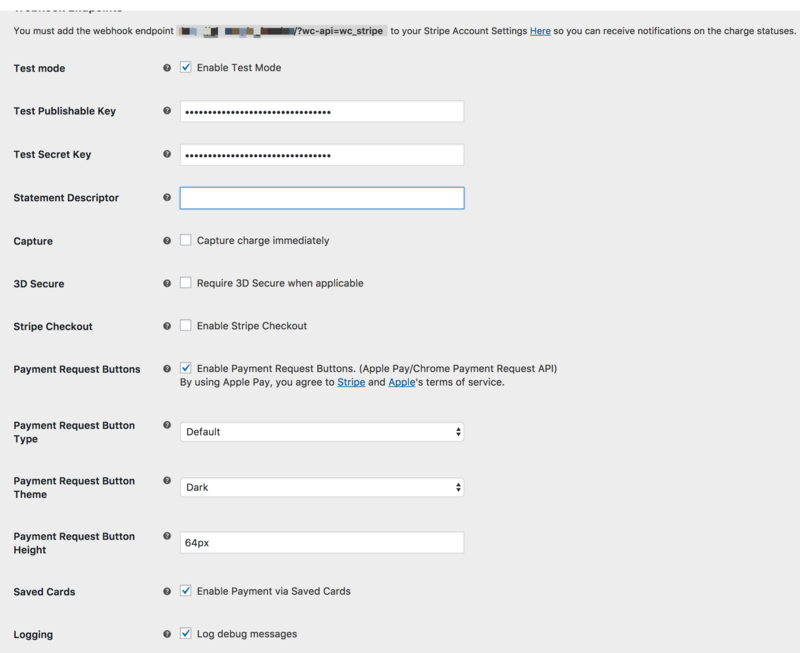 woocommerce_credit_card_form_start ($gateway_id) – Before showing the credit card form. woocommerce_credit_card_form_end ($gateway_id) – After showing the credit card form. wc_stripe_checkout_receipt_page_before_form – Before showing the Stripe Checkout (Popup modal) form. wc_stripe_checkout_receipt_page_after_form – After showing the Stripe Checkout (Popup modal) form. wc_stripe_checkout_receipt_page_before_form_submit – Before showing the Stripe Checkout (Popup modal) form submit. wc_stripe_checkout_receipt_page_after_form_submit – After showing the Stripe Checkout (Popup modal) form submit. wc_stripe_checkout_return_handler ($order) – Stripe Checkout (Popup modal) after submitting the payment in the popup. wc_gateway_stripe_process_payment ($stripe_response, $order) – The response we get back after calling a charge request to Stripe but before processing the actual response. wc_gateway_stripe_process_payment_error ($error, $order) – Called when an error occurs during the process payment event. woocommerce_stripe_add_customer ($args, $response) – Called after creating a Stripe customer. woocommerce_stripe_add_source ($stripe_customer_id, $wc_token, $response, $source_id) – Called after creating/attaching a source to a customer. wc_stripe_delete_source ($stripe_customer_id, $response) – Called after deleting a source from customer. wc_stripe_set_default_source ($stripe_customer_id, $response) – Called after setting a default source to a customer. wc_gateway_stripe_process_redirect_payment ($response, $order) – Called after a redirect payment process. wc_gateway_stripe_process_redirect_payment_error ($error, $order) – Called after a failed redirect payment process. woocommerce_stripe_process_manual_capture ($order, $result) – Called after a manual capture of a charge within admin order. 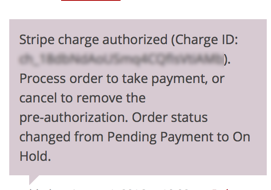 woocommerce_stripe_process_manual_cancel ($order) – Called after a cancel of the order that is authorized and not yet captured. wc_gateway_stripe_process_webhook_payment ($response, $order) – Called after a webhook payment process. wc_gateway_stripe_process_webhook_payment_error ($order, $notification, *$e) – Called after a webhook payment process error. wc_stripe_save_to_account_text ($text) – Text that shows to customers next to the save payment information checkbox. wc_stripe_payment_icons ($icons_array) – Icons that show next to each payment method. wc_stripe_send_stripe_receipt *boolean* – Whether to send a receipt via Stripe. wc_stripe_payment_metadata ($metadata, $order, $prepared_source) – Metadata that gets passed during a payment request. wc_stripe_generate_payment_request ($post_data, $order, $prepared_source) – Post data that gets passed during a payment request. wc_stripe_owner_details ($details, $order) – The owner details of an order. wc_stripe_require_3ds ($require_3ds, $source_object, $three_d_secure) – Override if 3DS should be required. wc_stripe_3ds_source ($post_data, $order) – Post data when creating 3DS source. wc_stripe_force_save_source ($force_save_source, $customer) – Override force save customer. wc_stripe_use_default_customer_source ($use_default) – Whether to use default customer source if source not found. wc_stripe_refund_request ($request, $order) – Request parameters when refund is requested. wc_stripe_PAYMENT_METHOD_settings ($settings)</strong – Admin settings for payment method. wc_stripe_checkout_verify_zip *boolean* – Whether to verify zip when using Stripe Checkout (Popup modal). wc_stripe_checkout_require_billing_address *boolean* – Whether to require billing address when using Stripe Checkout (Popup modal). wc_stripe_checkout_require_shipping_address *boolean* – Whether to require shipping address when using Stripe Checkout (Popup modal). wc_stripe_checkout_locale ($locale) – Sets the locale for the Stripe Checkout (Popup modal). wc_stripe_allow_remember_me *boolean* – Whether to show the remember me option for Stripe Checkout (Popup modal). wc_stripe_description ($description, $payment_method_id) – Override the description of credit card payments. wc_stripe_display_save_payment_method_checkbox *boolean* – Whether to show the save payment method checkbox. wc_stripe_sepa_mandate_notification ($method) – The method to use to inform customer of the SEPA mandate. wc_stripe_allow_prepaid_card *boolean* – Whether to allow prepaid credit card to be used. wc_stripe_elements_options – Additional options to manipulate Stripe elements. wc_stripe_elements_styling – Additional options to manipulate the Stripe elements styling. wc_stripe_elements_classes – Additional options to add classes to the Stripe elements. wc_stripe_params ($params) – Localized JS key/value pair. wc_stripe_payment_request_params ($params) – Localized JS key/value pair. wc_stripe_checkout_label – Label that shows up on the Stripe Checkout (Popup modal). wc_stripe_hide_display_order_fee ($bool, $order_id) – Whether to hide the display order fee in orders view. wc_stripe_hide_display_order_payout ($bool, $order_id) – Whether to hide the display order payout in orders view. woocommerce_stripe_request_headers ($headers_args) – Headers parameters for cURL requests. wc_stripe_idempotency_key ($key_string, $request) – The string for the idempotency key on request. wc_stripe_customer_metadata ($metadata, $user) – The meta data used when creating a customer. wc_stripe_create_customer_args ($args) – The arguments used when creating a customer. wc_stripe_localized_messages ($localized_messages) – The messages used from Stripe responses. wc_stripe_logging ($bool, $message) – Whether to log a specific message when logging is enabled. wc_stripe_webhook_review_change_order_status ($bool, $order, $notification) – Whether to change the order status when order review event happens. wc_stripe_PAYMENT_METHOD_supported_currencies ($currencies) – The supported currencies for that specific payment method. wc_stripe_payment_request_total_label_suffix ($suffix) – Label suffix to use when Payment Request is engaged. wc_stripe_payment_request_total_label ($label) – The total label to use when Payment Request is engaged. wc_stripe_payment_request_supported_types ($types) – The product types Payment Request supports. wc_stripe_hide_payment_request_on_product_page *boolean* – Whether to hide Payment Request button on product detail page. wc_stripe_show_payment_request_on_checkout *boolean* – Whether to show Payment Request button on checkout page. wc_stripe_payment_request_hide_itemization *boolean* – Whether to show itemizations when using Payment Request. You can delete the extension from your site if you decide that Stripe does not meet your needs. This code needs to be in place before you select Delete. Once you have deleted the extension and all settings removed, you can remove that code. The customer must have a compatible device and payment method in a supported region, otherwise, the option is unavailable. Currently, Simple and Variable products are supported. The buttons won’t show for other Product types (such as Bookings) and won’t work with custom product fields. Yes, please follow the link here for instructions Apple Pay Testing. 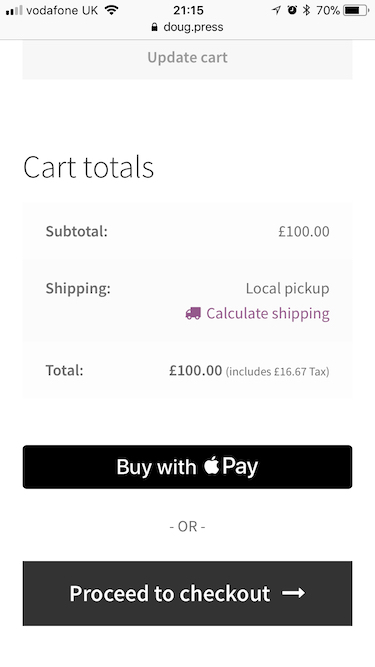 Yes, save a Stripe test card to your device, and view a product page. Using the WooCommerce Stripe extension and WooCommerce Subscriptions, you can have multiple subscriptions in your WooCommerce store. It should be noted that WC Subscriptions and the WC Stripe extension don’t use Stripe’s Recurring Plan feature, but instead manage subscriptions in WooCommerce and use token billing for each recurring payment. Note: You can style the size, margin, padding, and background color of the boxes. We try to use the latest possible. We’ll update it whenever we can. Note that you can usually update the API version on your Stripe dashboard without affecting our extension. For clarification, you can find which version we’re using in code on GitHub. As of version 4.1.2 Bitcoin is no longer offered as a payment method. This is due to Stripe dropping support for processing Bitcoin payments as of 23rd April 2018. No, not currently; we’re unable to integrate at this time. Yes! This is enabled in your Stripe account dashboard and will then work in WooCommerce. See Stripe’s documentation about Avoiding fraud and disputes. Yes! This is an option in the extension settings. 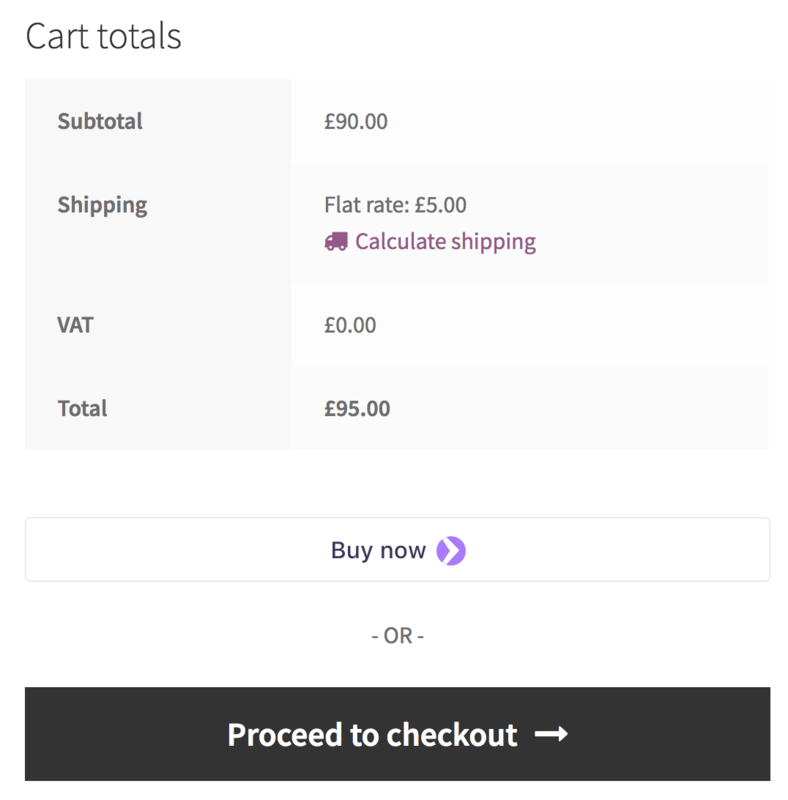 Charges can be captured from within the WooCommerce dashboard. Please note that un-captured authorizations will expire after 7 days. Change the order status to processing or completed to capture the payment or cancel the order to remove the pre-authorization. Yes, please see more info on our WooCommerce Refunds documentation page. Not currently but Stripe are actively working on this. For more details, please add your votes to our Ideas board. WooCommerce Subscriptions does not use the Stripe Subscriptions feature. Instead, it uses a Stripe Customer and Card token and controls the processing of recurring payments. This avoids any potential issues that could occur by trying to keep two copies of each subscription’s data in sync on two different systems (one in your store and one at Stripe). It also and makes it possible for Stripe to support all of WooCommerce Subscriptions’ features, like payment date changes, rather than only those the Stripe Subscriptions allows. Because of this, you will not see subscriptions created with WooCommerce in your Stripe Dashboard as Subscriptions. This does not mean recurring payments will not be processed. As long as your store is running correctly, recurring payments will be processed correctly and will show up in the Stripe Dashboard as Payments. The WooCommerce Subscriptions extension has its own mechanism for saving credit card details. When a customer buys a subscription product, Stripe will create a special payment token that will use the same credit card details for future subscription payments. Saving the same card again on the customer’s account is not necessary unless you want to allow the customer to reuse the card for other purchases in your store. You can change it via a built-in hook. Here is an example showing the use of the hook changing out the Visa logo. There are known issues with the Root Relative URLs plugin. You will not be able to use this with Stripe. Loading headers/footers in a non-standard way. WooCommerce uses get_header()’s get_header action to init the checkout and load scripts. If you are not using get_header() you either need to do so, or you need to trigger the get_header action manually using: do_action( ‘get_header ); in your custom header loader. That could mean your server configuration is not allowing files/paths to be written in that location. You would have to manually do this by following the step outlined here. Try manually doing this by following the step outlined here. Ensure that you have entered the correct keys. If you are in Live Mode, you should have entered live keys (not test keys). Have a question before you download? Please fill out this pre-sales form. Already using Stripe and need some assistance? Get in touch with a Happiness Engineer via the Help Desk. Have a suggestion regarding a feature you’d like to see included in this product? Add it to our Ideas Board. In version 4.1.14, we removed some styling from the plugin as mentioned in October 2018. This was done to allow themes to style the Stripe checkout forms to match. However, this is not recommended. It is best to remove any custom styles you or your theme author has applied for Stripe and let the core theme handle the styling. *Consult with your theme author if you do not know how to apply custom CSS styles. The Stripe payment method is not showing. The Payment Request Button is not showing. What type of Products can be purchased with the Payment Request Button? Can I test Apple Pay? Can I test Google Pay? Can I hide the Payment Request button on the single Product page? Can I hide the Payment Request button on the Cart page? Can I show the Payment Request button on the Checkout page? Can a single customer have multiple subscriptions? How can I change the style of the Stripe Form? What version of the Stripe API does this extension use? Does this extension support Bitcoin? Does this extension support Stripe Connect? Does Stripe use AVS – Address Verification System? Does Stripe Support Authorization and Capture? Does Stripe allow refunds inside WooCommerce? Why aren’t my subscriptions displayed on the Stripe Dashboard? Do I need to enable “Saved Card” to process subscriptions? How can I change the payment icons used such as Visa, Mastercard…etc? How can I change the width of the Payment Request button? I’m getting an API error.